Right after my in-laws left, I had a new set of family come into the area. They stayed with my grandmother for about 2 weeks and during that time, we saw them a few times. They wouldn’t be back any time soon because they came from Germany. Story has it, my grandmother’s sister fell in love with a German man and moved back to his country. Once there, they had one child, who came to visit us on vacation with her husband. The first time we saw them was just a ‘hello, how are you?’ The second time, we met at SeaWorld and walked around a little and then split. The time after that, we went out to eat spanish food and then a few days later, I cooked them a proper spanish meal. You know, one with flavor. The last time we saw them, we went to the first day of Epcot’s Food and Wine Festival. They were pretty fun to spend time with, even though there was a little bit of a language barrier; she spoke english fluently but he only knew a few words. When they left, my grandmother was left with quite a few food items. Of course, I get a phone call. Honestly, my grandmother is closing in on 70 and sadly she is very close-minded about food (when you grow up in a family with 13 other children, you don’t really get to experience a lot in the way of food growing up, so she didn’t have much of a foundation). While she kept things like, chocolate pie, sodas, popsicles and such, I was given onions, olive oil, an italian glaze, shiraz, and whole wheat bread(she doesn’t even eat the brown stuff!!). I got home and panicked. I’ve never cooked with wine before and if my family can do it, why can’t I? I had four onions and shiraz to cook with. I knew I had chicken, we always go. So I went from there. I went on google, read a few recipes and found a base to work with and I then proceeded to ‘get jiggy with it.'(na-na-na-na-na-na-na). I then proceeded to make this gluten free and not adding ANY sodium to anything. Low sodium dishes are getting easier and easier. Sprinkle your chicken with the thyme, parsley and garlic powder. Once your pan is ready, place your chicken about and leave it alone for about 6 minutes. While it’s browning, place the 1 cup of water and bouillon into a small pot and bring it to a boil. Turn your chicken and then turn your attention to your medium onion. Chop it thoroughly and set to the side. 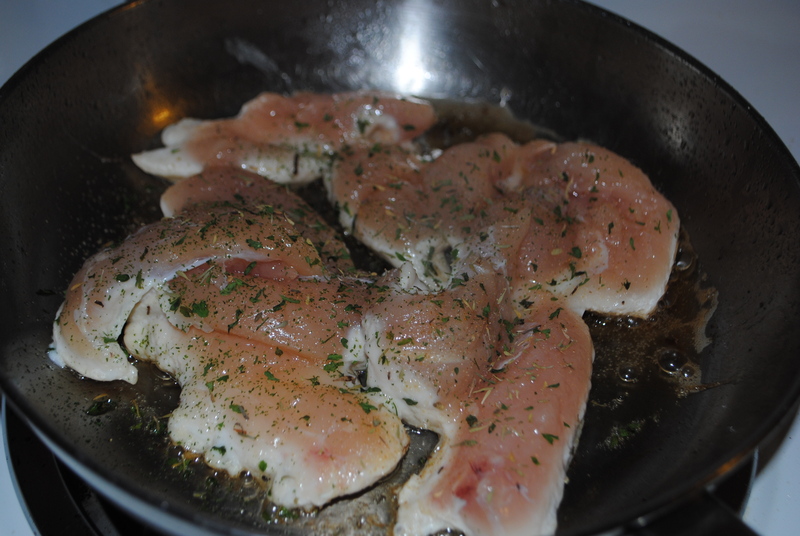 Once your chicken is browned on both sides, remove it from the pan and place in a bowl. Add the last tbsp of butter to the pan you were just cooking the chicken in and toss the onions on top. Give it a quick stir and chop up your garlic while your onions brown. Toss the garlic on top, give it another quick stir and add the broth. Stir very well, removing any fond from the pan. Personally, I cut the chicken into smaller pieces, but you can place the chicken, in larger pieces, back into the pan. Then add the wine and make sure everything is mixed throughout and then place your lid on the pan. Once covered, I reduce the heat a bit and I let it all simmer for at least 6 minutes. This dish has a delicious sauce that makes absolutely great over a bed of rice with a side of veggies. Last time I made it, I used brown rice pasta. Following my own tips!! 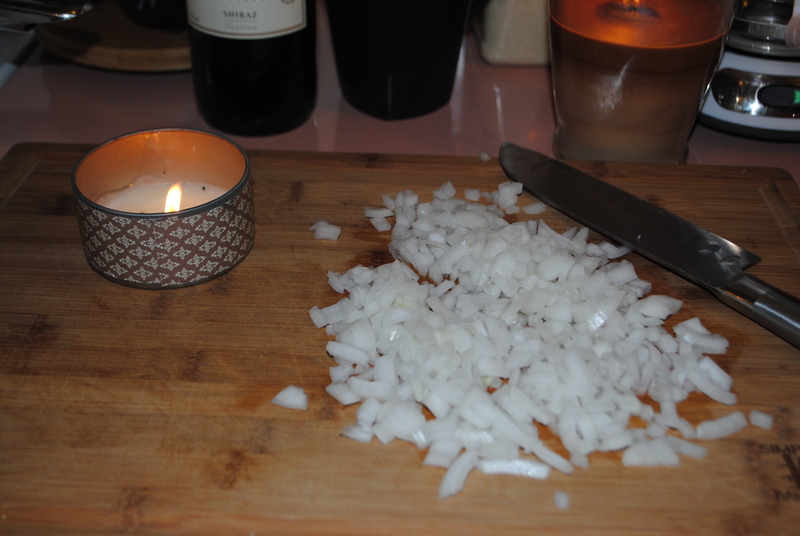 Candles around my cutting board to help with the onion tears! 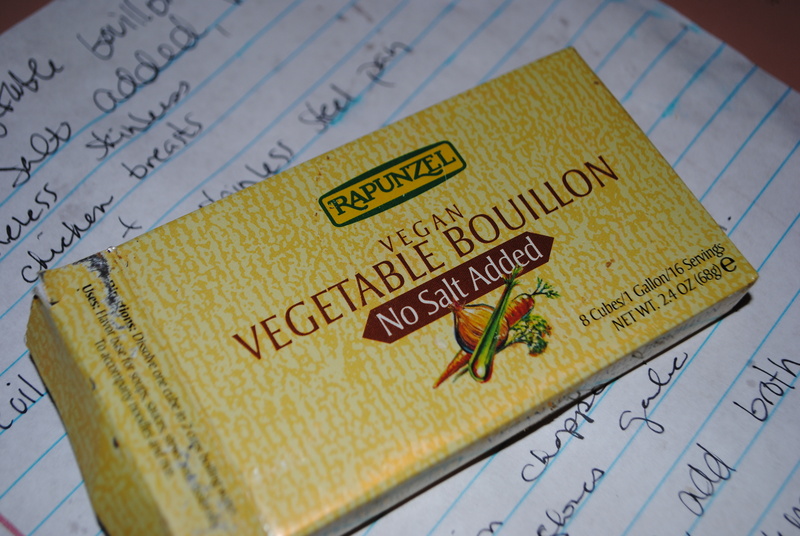 The bouillon I used. NO SALT ADDED?!?! WHAAAAAAT? I wanted to include this photo so that people knew that there were, in fact, options like this out there! I purchased this in a local Whole Foods. It can probably even be ordered online. I know it’s silly to be so excited about this, but broth is always ridiculously salted! 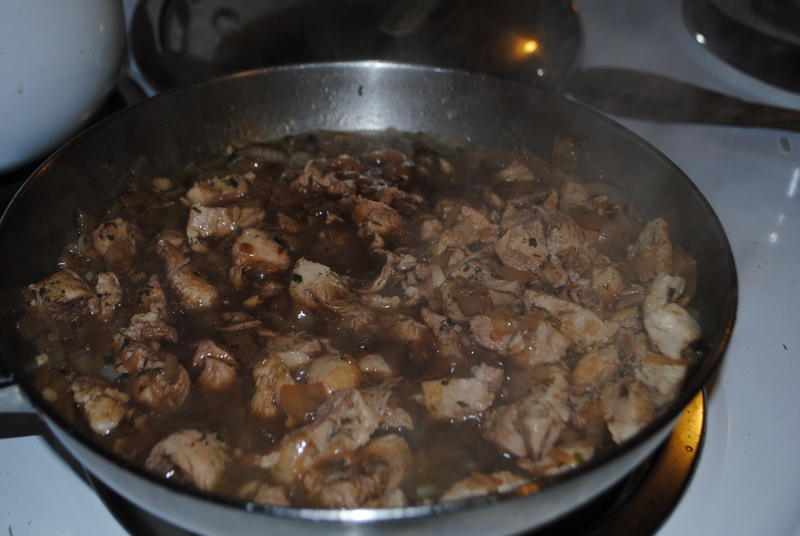 This entry was posted in Food and tagged added, braised, chicken, easy, garlic, GF, gluten free, healthy, low sodium, no salt, one pan, onion, recipe, red wine, shiraz, simple by themcdorkins. Bookmark the permalink.